Have You Heard of Surya Murali? If you've ever looked for room models in the 3D Warehouse, you've probably heard of Surya. She's a Kuwait-based engineer who designs living spaces as a hobby in her limited spare time, and she's become quite well-known for her fabulous models and interesting, multi-themed designs. Searching the 3D Warehouse for "surya room" will turn up about 30 of her designs, and these don't even include her gorgeous furniture models. Some of her most interesting models were not included in the book, since we had to keep the projects relatively simple, but if you have some time, look around the Warehouse and see what she's done. 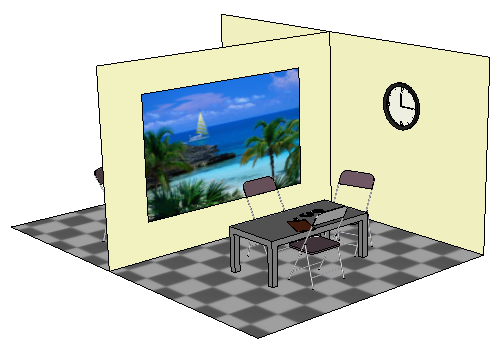 When you download one of her room models, you'll see a rendered image, inserted into the model as a graphic. 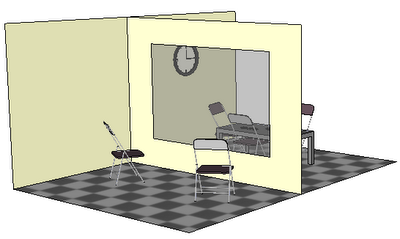 These are done in SU Podium, where Surya added lights, textures, etc. I was a little surprised to find out Surya isn't a professional interior designer; she's an electrical engineer. It's a rare person who is both technical and creative, and while I can only assume she's a talented engineer, it seems obvious that her sense of space, lighting, color, and layout are quite amazing. This design work (including the visualization in 3D) is just some stuff I do as a hobby when I get free time or when I am in the mood for it. And free time is something I haven’t had for a long while now. I have done a bit of free-lancing works for a few clients from UK & US… I am not a professionally qualified architect or interior designer so I haven’t really ever carried out a project from design board to construction site on my own. Being an electrical engineer, I have a good enough idea of lighting and such stuff but the civil & structural part of my designs are based on common sense and instinct. This interest in design started quite early as I loved to make room layouts as a child, but the idea of designing whole structures (not just the interiors) came when I had made a design for a bungalow / villa for my folks in India… and they ran the design by a licensed architect and structural engineer. Those guys would not believe that the design was created by someone with no architectural or civil engineering background. Of course, I had drawn in a pillar too many to make sure the structure won't collapse but all in all it was a structurally sound & uniquely pleasing design according to them. That set me rolling though I still prefer doing the interiors of a house (requires less structural work). I'm grateful that Surya was willing to lend her models to one of my projects, and I hope she continues to create beautiful spaces. Last week I got an email from Geoffrey Winship, a teacher in Toronto, raving about a model created by one of his 13-year old students. I was blown away, and made this video to show what the model does. You can download this model from the 3D Warehouse by clicking the image below. To make the catapult work, you need the Sketchy Physics plugin. It's free and can be downloaded here. Once you get the executable file, the plugin should self-install. I just thought I would share another amazing project from one of my students. It is the reason I teach, to be able to watch and share when students learn these remarkable things. I know you are working on something with SketchyPhysics, so I knew you could appreciate this. As background, I teach Science and Design and Technology in the Toronto District School board and began using SketchUp this year. I gave my grade eight students an assignment of building trebuchets or catapults that would throw small potatoes at bridge models (which were made by my grade seven students). One of the components of the assignment was to produce a set of orthographic and isometric drawings to complement the physical model submission. Students could use pencil and paper or SketchUp to produce the drawings. A superior submission would make connections or somehow extend the project beyond the original expectations. Here is what my student submitted; a working model, including a hopper to load the balls into the catapult. She included multiple versions with different angles in the catapult for more force or accuracy. She even included text instructions to tell me how to operate it. I am thrilled that she has taken to this medium so naturally and has explored beyond what we have discovered in class. Her first two languages are Korean and Mandarin, although now she's quite good in English. As for training, it's only what I teach in class and what she's discovered on her own. I introduced SketchUp to my students for the first time this winter, having discovered it myself, just before Christmas. I took some extra time to show her the basics of Sketchy Physics with spheres, blocks, motors, wheels and servos and also some pistons. That probably amounted to about two hours in total, focusing on Sketchy Physics. I also got into the idea of user interface being able to control the speed or strength of the device, but I did not even know the full extent of what the plug-in could do. I don't know how she figured out the keyboard control, but from speaking with her, the ideas for the sphere loader are all her own. She's quite good in all subject areas and she is the recipient of this year's Science award for our school. She was also part of a four-person team that went to the Skills Canada Technology Challenge in Waterloo, Ontario. The team took home a third place medal for Ontario, building a device (using gears, levers, pulleys and wood) that cleared rubble from a model of the shoreline of Japan's earthquake disaster zone. On a personal note, as a female engineer, I'm so glad this model was created by a girl! This model has lit a fire under me to get cracking on a Sketchy Physics project book, once I finish the other stuff on my plate (interior design book, updating other books). But it's high on my to-do list! What's Coming in Our June Projects? Imagine one of those police dramas in which the suspect is interrogated in one room, and detectives are watching the interrogation from an adjacent room. From one side the police can see in . . .
. . . but from where the suspect is sitting, the window looks like a harmless travel poster. This project demonstrates how material translucency works in SketchUp. All you need for this project are the Circle and Rotate tools, and you can create beautiful round and spiral patterns. My favorite is the intricate-looking (but actually rather simple) red and yellow creation on the right! 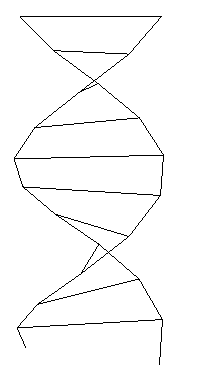 Last month, Part 1 of this project showed how to create the "skeleton" of the two helixes plus the base pairs between them. Part 2 will show how to transform the skeleton into the 3D model. Don' worry - if you sign up this month to subscribe, you'll also get Part 1. The subscription is still just $36 for 12 monthly sets of 3 projects. And these projects make for some great summer reading! You can sign up here.